Papercrafts by Patti: PPA 100 Celebration and Huge Blog Candy Giveaway!! 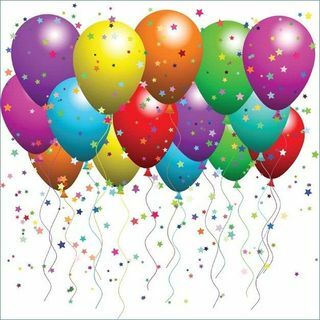 PPA 100 Celebration and Huge Blog Candy Giveaway!! 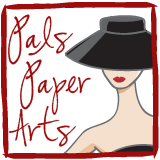 Pals Paper Arts is celebrating our 100th Challenge with a Technique Challenge AND a huge Blog Candy Give Away! Read this post to see how you can become eligible to be showered with Blog Candy by the PPA Design Team!! Here I stamped my image onto Elegant Eggplant card stock using White Craft Ink. Then I added Crystal Clear Embossing Powder and heat set it with my heat gun. I couldn't get a good photo of the 3-D look that embossing brings to your project. On this Large punched Oval, I used the same image, but stamped it onto Whisper White using Versa Mark 'Ink' which is a clear 'ink.' Then I took a sponge and rubbed it onto my Elegant Eggplant stamp pad and rubbed it over the image. This makes the "invisible" image appear by providing a dark background. I decorated the flower withe a basic rhinestone and added my sentiment punched out in the Modern Label shape. 1. Make a project sharing a "technique." Ideas: Paper-piercing, Embossing, Faux Stitching, Pop-up card, etc. 2. Upload your project onto the PPA site with a DIRECT LINK to your blog or gallery. (Please don't link any projects that have already been blogged or shared on a gallery--they are not eligible for the Blog Candy). Best wishes for your win! Today is the LAST day to order from the 2010-2011 Idea Book & Catalog from Stampin' Up! Tomorrow our *new* catalog debuts! Here are the LAST CHANCE ITEMS. These items may sell out quickly and are updated often. For best results, order early using my website! 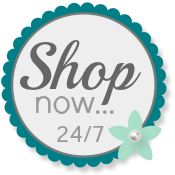 Please let me know if you have questions about Stampin' Up! products or any of the projects you see on my blog. I'd love to help you create your own cards and paper crafts! Elegant Eggplant certainly lives up to its name here! It is very elegant when it is embossed! Beautiful! Beautiful card. I love the monochromatic look and the embossing just takes it up a few levels. Beautiful card...embossing is one of my favorite ways to dress up a card! Patti congrats on the PPA's 100th. Your card is goregous! I LOVE how you did the reverse embossing... wow. Stunning effect. Thanks also for a chance at some GREAT blog candy! Someone is going to be SUPER HAPPY! Hugs. Wow, Patti! This has to be one of the most beautiful cards you have ever designed! It is STUNNING! Embossing looks so dynamic on elegant eggplant. And jewels add the perfect sparkle. Not a purple fan, but I sure do like this card. The composition is incredible! Oh, so pretty Patti. Love the lovely colors and the swirls. The emboss resist technique is fabulous. OH THANK YOU MS PATTI, I CAN ALWAYS COUNT ON YOUR COMMENTS!